and IT IS ALL ON-LINE. This means reaching potential customers on a daily basis at a fraction of the cost for 4-color printed magazines. With our on-line magazine and its hot link capabilities, you may have as detailed an advertisement, as your imagination will create. Our chat room, daily news stories and other features make your advertisement a frequent stop for your customers. In printed magazines only a few of the people who read the magazine see any particular advertisement, and they typically only pick up the magazine once or twice per issue. With our on-line format we give the readers ample reasons to visit often thus increasing the value of all advertisements. Don't put your advertisement dollars in magazines that become stale within days. The ESD Journal has been on-line for over 9 years. During this time we have never attempted to "spam" the industry to increase our reader base. We have built the over 220,000 visits per month one reader at a time by reporting on items of importance to ESD professionals. We have built this base of industry readers by being active in the committees and companies serving the industry. Our experts are active in the ESD Association and ASTM. We have become the "portal" for the ESD Industry. Companies such as Hewlett-Packard and Motorola list our magazine as one of their "to be viewed" references. "I liken it to a USA Today for ESD control." Unlike "ink & paper" magazines, the ESD Journal's over 220,000 visits per month are pre-qualified since the readers made the effort to seek out the magazine on-line. Advertisers of the ESD Journal are likely to have their ad seen 220,000 times per month. 6% of those that pick up the magazine will see a particular advertisement. One major trade magazine for our industry has approximately 80,000 subscribers per month. Which means that only 4,800 people may see a particular advertisement and, it is unlikely that the magazine will be read more than once. The ESD Journal is the only trade magazine in the industry with its own labs and experts for testing products, ideas, theories, inventions and products. We have been likened to the "Consumer Report" for the electrostatics industry. 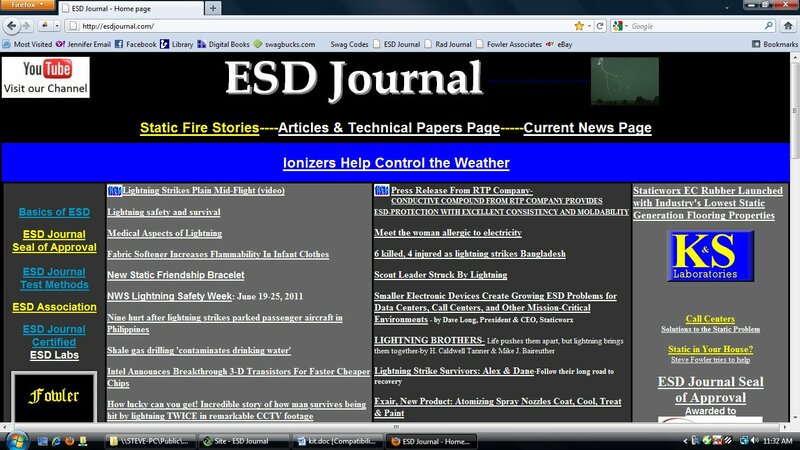 The ESD Journal changes daily and is read by some ESD industry personnel four or more times per month. Advertising dollars are much more cost efficient on the ESD Journal than any other magazine for the ESD industry-paper or cyber. ESD Journal is currently updating the statistics, please check back later! How Do I Advertise In ESD Journal? Advertising in ESD Journal is easy. Simply E-mail the information to us at esd6@esdjournal.com. We also offer hosting your own web site internal to our magazine. In effect your advertisement becomes many pages deep. Email (jhazen@esdjournal.com) or Call (864-574-6415) Jennifer for details. The chart below shows the advertising rates for different placements on the ESD Journal. 1. The ESD Journal is changed (Published) daily. All materials should be submitted by electronic mail if possible. 2. Closing date for advertisements is the end of the month, preceding the month of inclusion of the advertisement in the ESD Journal. Cancellations are not accepted after the closing date. 3. Materials are due the 15th of the month preceding the month of issue inclusion of the advertisement in the ESD Journal. 4. Ad material requiring additional preparation must be submitted with the insertion order at least one week prior to materials due date. Late ad changes cannot be guaranteed by the Publisher and are subject to additional charges. All copy is subject to the Publisher's approval and acceptance. The Publisher reserves the right to reject advertising. The Publisher reserves the right to insert the word "Advertisement" in advertising that simulates editorial format. Contracts may be canceled by the Advertiser or the Publisher on written notice, 14 days in advance of the closing date of the issue. Should the Advertiser fail to fulfill his contract, the Publisher may bill the Advertiser for any deficiency based upon the rate earned upon cancellation by the Advertiser. Advertisers and their Agencies are solely responsible and accept full liability for all contents of their advertisements. The Publisher shall not be liable for delays in publication to the Internet, or for failure to publish or distribute all or any part of the publication to the Internet due to circumstances beyond the Publisher's control. Further, the Publisher shall not be liable for damages if for any reason he fails to publish an advertisement. The Publisher assumes no liability for errors or omissions in key numbers, reader service description, reader service numbers or the index of advertisers. The Publisher's liability for any error will not exceed the charge for the advertisement in question. No conditions, oral or printed, which conflict with the Publisher's policies, will be binding on the Publisher. Failure to make the Advertiser's order correspond in price or otherwise with this rate schedule is regarded only as a clerical error and publication is made and charged for upon the terms of the schedule in force without further notice. The Advertising Agency and the Advertiser assume and agree to pay the charges specified in this Rate Schedule for advertising published at their direction. In the event the Advertiser and/or Agency default in payment of bills, the Advertiser and/or Agency will be liable for all fees and sums of collection, including but not limited to reasonable attorney's fees and court costs incurred by the Publisher in the collection of said bills. Jurisdiction and venue for any litigation ensuring from advertising placed in the publication shall properly lie in Spartanburg County, South Carolina.